You have many choices when trying to decide where to best spend your time and money at an HR industry conference. In the HR field, there are several that rise to the top and specialize in fascinating topics like compensation planning, HRIS, innovation and disruption — depending upon what you want to learn more about. We feature the standouts below and invite you to add Compference 2017 to complete your list. 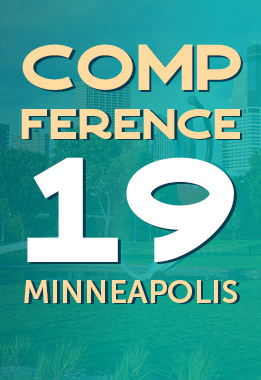 This conference is specifically designed for compensation professionals — most who attend have the word “compensation” in their title. It is fairly technical in nature and also focuses on thought leadership. SHRM has been the predominant conference for HR professionals. It is huge, multi-track and multi-level. The emphasis is on entry-level and mid-level HR professionals and includes lots of fanfare and big name keynote speakers. You’ll encounter many sessions about wellness, learning and development, benefits and how to get those things right for your organization from a broad generalist perspective. This conference also has great information on how to up level yourself as an HR practitioner. Newer to the conference scene, Globoforce’s WorkHuman event calls itself the “next generation” of HR conference. The conference is focused on recognition but touches on performance and compensation as well. Content is a combination of engagement, entertainment and recognition for the participants as well as Globoforce’s customers. It features big name key notes supported by high production value and aims for a “feel good” vibe. HRTech is a wonderland of HRIS and HR technology platforms allowing HR professionals to find out what’s out there, what can help them improve their jobs and how. For all things system- and platform-related attend HRTech. A newer conference on the HR scene, the DisruptHR one day conference is done regionally in cities around the world. It utilizes the ignite format (20 slides, five minutes per presentation). Attend this conference and you’ll experience both engaging presentations and cutting edge thinkers who are truly disrupting the HR field and how folks go about doing their HR business. Last, but not least, is PayScale’s Compference. This is the “love child” of all the other conferences. It combines compensation planning, systems and technology and disruptive and innovative best practices you can take back to your company to implement right away. #Compference17 gives practical information about how to excel in compensation strategy because what you pay says a lot about your company. You’ll get tips on how you can attract and retain top talent as you explore the link between compensation and culture. Topics and speakers cover compensation in terms of engagement, transparency, fairness and communication. This is a customer-focused conference and we encourage attendees to bring their “whole self” so we can all be better and more empowered for the collective experience. What are your favorite HR conferences? Let us know in the comments.